There lives a dream in every well-bred Trinidadian's heart. And it is for his child to play that most classic of instruments, the Piano. Unfortunately, locally recorded Piano music is not accessible to music lovers, but this new Sanch CD is about to change that. 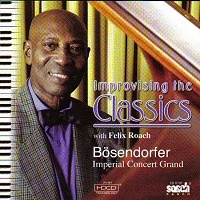 "Improvising the Classics with Felix Roach" is living proof that good music of every stripe is very close to the Trinidadian ethos and way of life.